Female cone has whorl of loosely arranged megasporophylls. In cycas, whereas in pinus there is in compact arrangement of megasporophylls, behave ovuliferous scale. 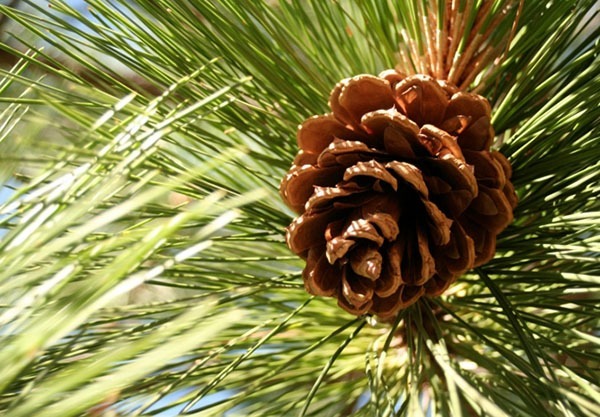 So, in pinus female cone behave as inflorescence due to aggregation of female flower (ovuliferous scale). The ovule in all gymnosperms is orthospous. The integument is differentiated into 3 layers outer fleshy (outer Sarcotesta), middle stony layer (sclerotesta) and inner fleshy layer (inner sarcotesta). The ovules are naked in gymnosperms i-e. They are not enclosed by envelop of megasporophylls. The integument enclose nucellus with a micropyle at the apex of ovule contains one or several sporogenous cells (Megaspore mother cell). Each developing into linear row of four potential megaspores. Only the lower most megaspore is functioning behaves functional megaspore or chalazal megaspore and form embryo sacs prothallus (Female gametophyte). And other three one’s degenerate. The male gametophyte develops from microspore within micro sporangium (pollen sac) in partial form known as pollen grain (immature male gametophyte) upto liberation. During incomplete germination when they are librated, these are act 3- celled stage in cycas (cycadales). 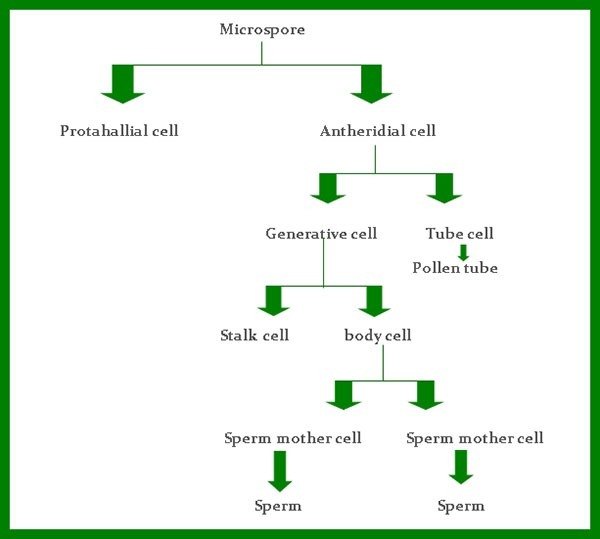 (One prothallial (degenerative cell), one degenerative cell, one vegetative cell or tube cell), 4- celled stage (2 prothallial cell) in pinus (coniferales) Ginkgo (Ginkgoales) and %-celled stage in Ephedra. Pollination is direct i.e. pollen grains come in direct contact with the ovules. Pollen grains are caught in the mucilage drop oozing out (seep out) discharge from micropyle. As the drop dries the pollen are taken back into the pollen chambers. 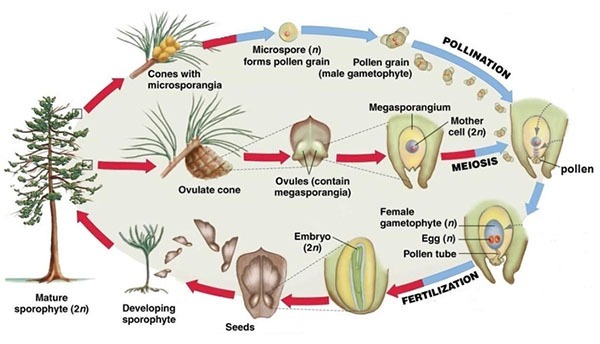 After pollination pollen grains germinates into mature male gametophyte with containing of two male gametes (sperm) which are flagellated in cycadales and ginkgoales while non-flagellated in rest of all gymnosperms, as well as pollen tube cells, stone cell, pollen tube. Gingkales as well as cycadales sperms are most enlarged in size as compared to all other plants in kingdom plantae. The female gametophyte of cycus bears 3-6 archegonia per ovule, 2 in pinus. Genetum and Welwitschia female gametophyte does not possess archegonia. The archegonium of genetum is represented by ovum containing egg and venter canal cell, neck canal cells are absent. In cycas neck present; no ventral cell; ventral nucleus present. In pinus neck canal cell does not present. Exceptional gymnosperms like cycadales and Ginkgoales show zoooidsiphonogamy (The condition in plants, in which fertilization take place with the help of pollen tube as well as through motility of sperm in pollen tube, there is long time in leaves between pollen tube and fertilization in all gymnosperms exceptional cycus. The mostly gymnosperm show free nuclear division for embryo development, exceptional genetum and Welwitschia. Wall formation stands when numerous nuclei have formed in cycas whereas in pinus starts when eight nucleate stage is attained. Embryo development is mesoblastic i.e., Develops from a small part of zygote this type of development is shown only by gymnosperms an all plant kingdom. The poly embryo (the condition in which there is more than one embryo development) may arise by the fertilization of more than one egg such as cycus or by the division of the zygote (cleavage polyembryo) e.g. pinus. But at the end only one survive due to nutritional competition. The number of cotyledons may be two (cycus) or many (pinus). But mature seed has testa (middle stony layer), brown papery tegment (inner fleshy layer), peris sperm or nucellar caps (nucellus) behave as nutritional layer present in all gymnosperms. Exceptional cycas as well as cotyledons and embryo, endosperm. 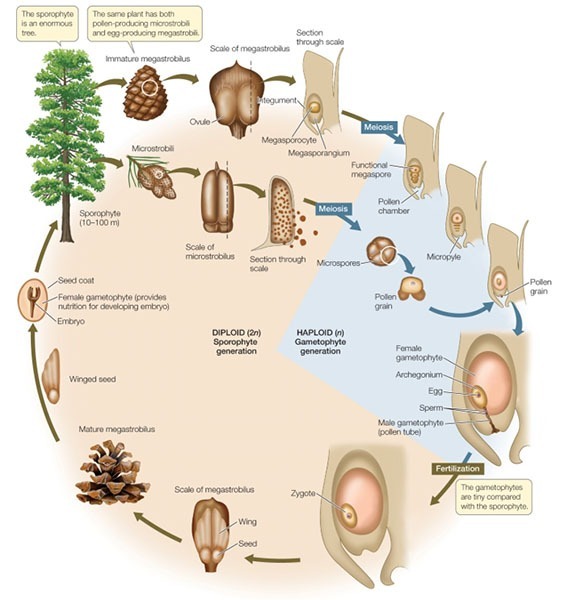 So, the seed represent three phases in the life cycle of gymnosperms. Integument and nucellus represent the mother sporophytic phase (first sporophytic phase). Embryo the next sporophytic phase (as it develops from the zygote). 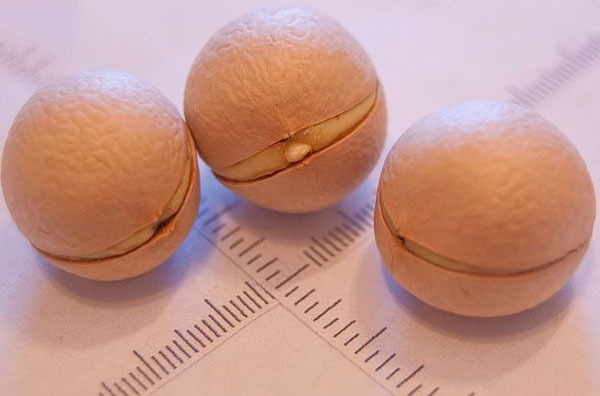 Except in cycus and ginkgo, the seeds remain dormant for some time and then germinate under favorable conditions. Germination is epigeal in all gymnosperms exceptional cycus which shows hypogeal germination of seed, cotyledons forming the first leaves. On germination, the seed coat is ruptured and the embryo develops into a new sporophytic plant. The growth of plumule is limited in case of welwitschia. The diploid sporophytic phase is dormant, whereas the haploid gametophyte phase is reduced, development on the sporophytic phase.